Today the Farmhouse Hens are displaying milk glass throughout our homes. 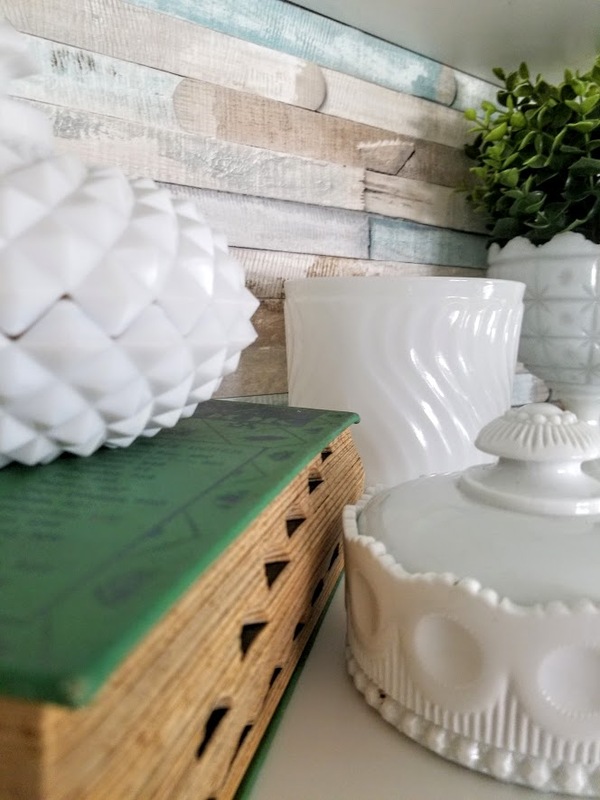 Make sure you scroll to the bottom of this post so you can click around and visit my talented friends and be inspired by their fabulous milk glass vignettes. 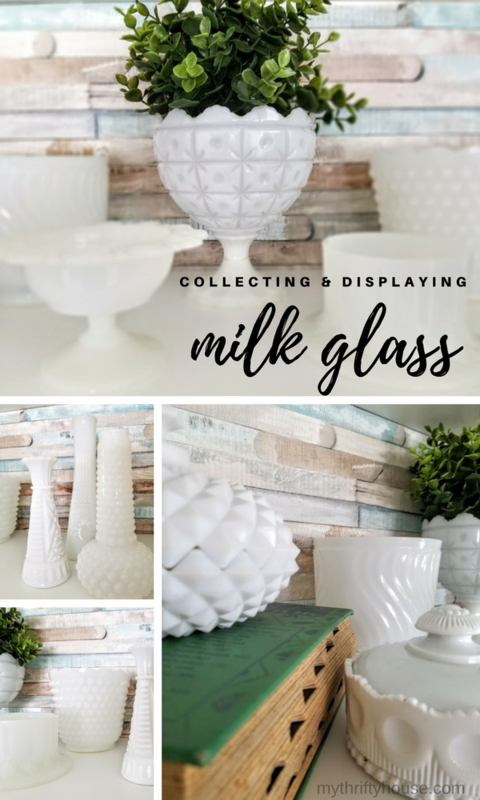 I have struggled with the idea of displaying milk glass in my house because I wasn’t sure where to put it and how to group my collection together. I am fairly new to collecting milk glass and don’t have a very large collection but I am off to a great start. I am drawn to the plain and simple color of the white glass, the various shapes and sizes not to mention all of the fun, pretty patterns. 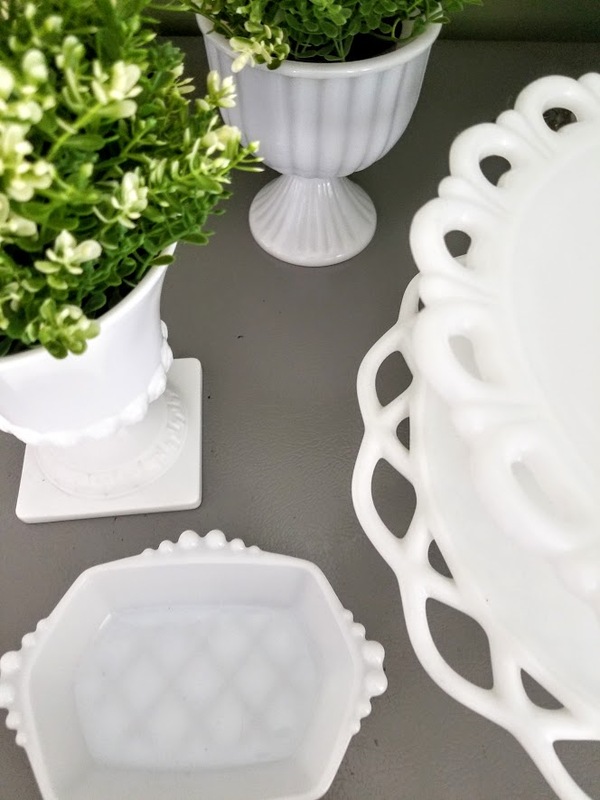 Since I frequent the local flea markets and thrift stores often, it’s fairly easy to find pieces to add to my milk glass collection but I’m kind of picky and have certain rules when it comes to making my purchases. My first rule is price. I rarely pay more than $2 for a piece of milk glass. My second rule is pattern. I am not a fan of the grapes and leaves pattern and will usually pass on those pieces. My third rule is no more bud vases. 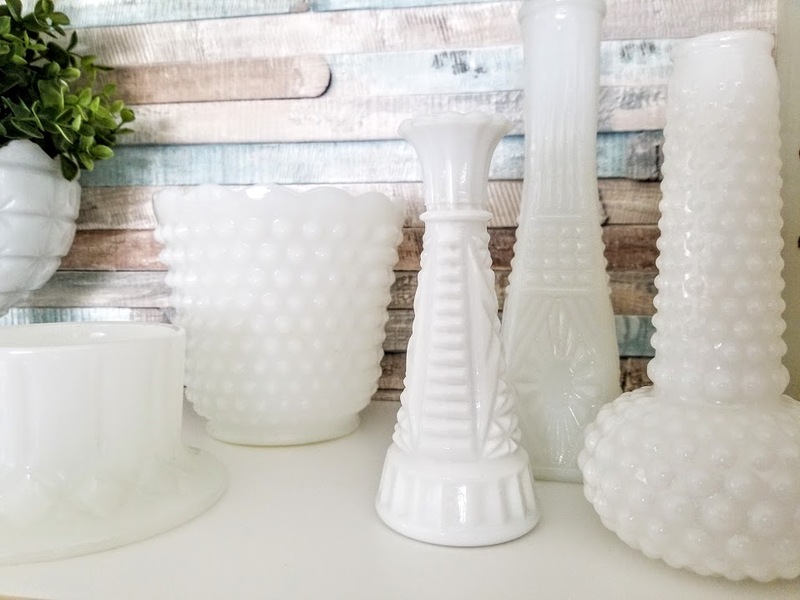 Milk glass bud vases are probably the most common and abundant piece to find. With that being said, on occasion, I have broken my own self imposed rules for purchasing milk glass. If I find a rare or unique piece I will pay more for it. I paid $15 for a cake stand because I had never found one like it without chips or cracks. Although I am not a fan of the grapes and leaves pattern I do have a few pieces because they were gifted to me. I did purchase a creamer because I wanted to use it as a planter. Bud vases are probably to most common milk glass pieces to find. 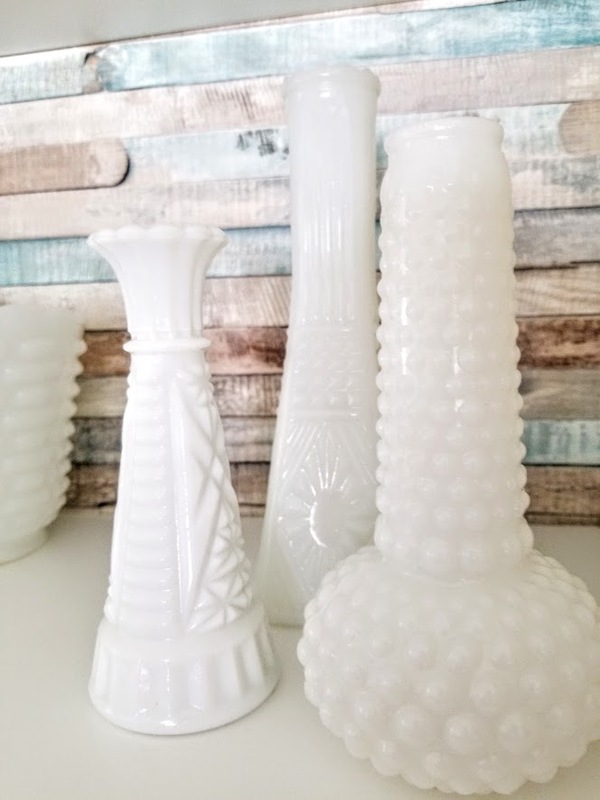 I have plenty of milk glass bud vases in my collection but if I see a unique shape or pattern I will pick it up. Recently, I found a square bud vase for $3 at the thrift store. 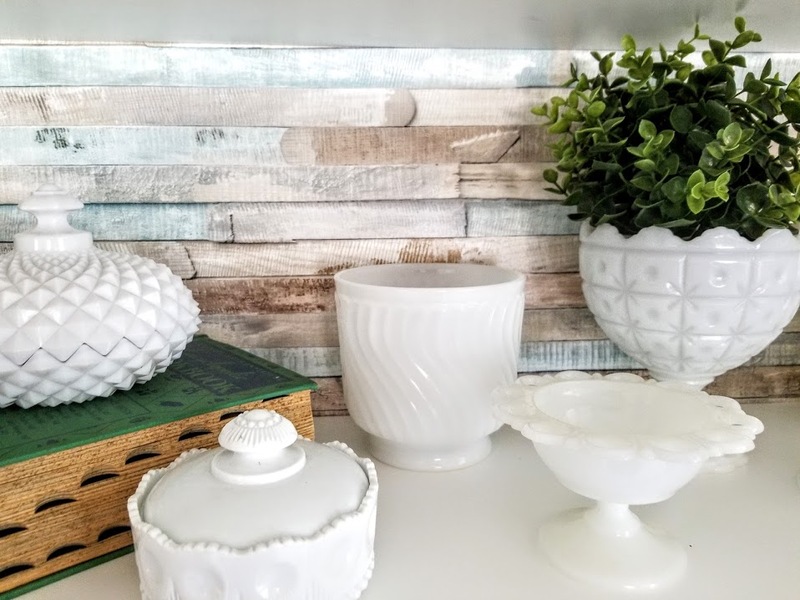 For now, I am displaying my milk glass collection in my farmhouse kitchen but I like to move things around and this will probably be temporary home for my growing collection. Wait….don’t stop here. 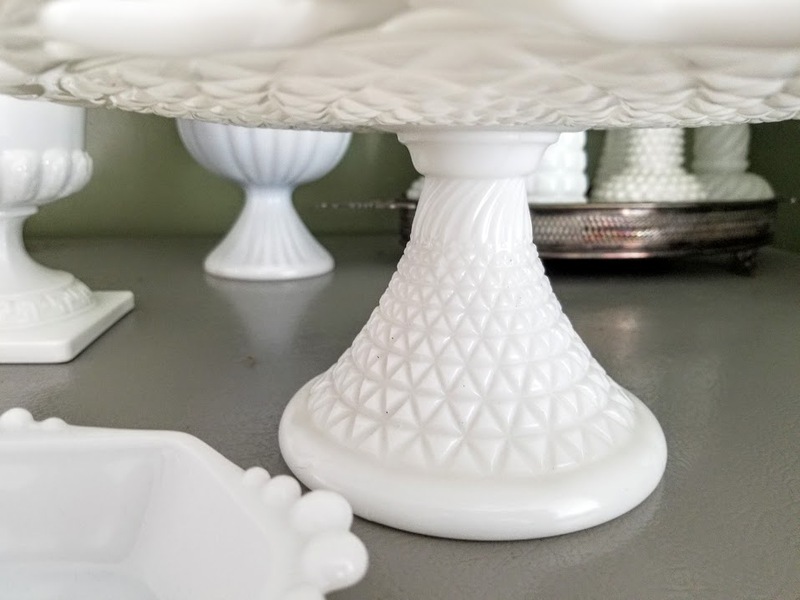 Keep scrolling for some amazing milk glass inspiration from the Farmhouse Hens. This entry was posted in Farmhouse Hens, Home Decor. I have total Milk Glass envy!!!! So hard to find here!! Love it all and how you have displayed it!! Stunning collection! Thanks Sam. I’ll be shopping for you as I see things here in the states. You are definitely off to a great start! I love the cake plate and never have come across one. 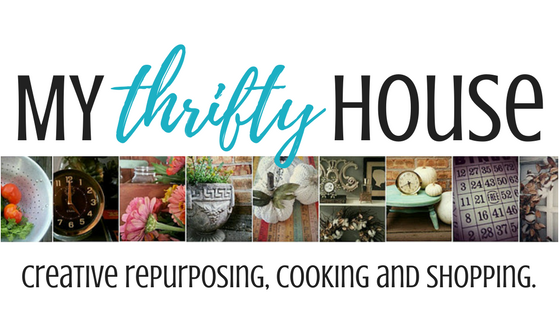 I’m hoping when flea market season starts up again I will find some new pieces. Have a great day! 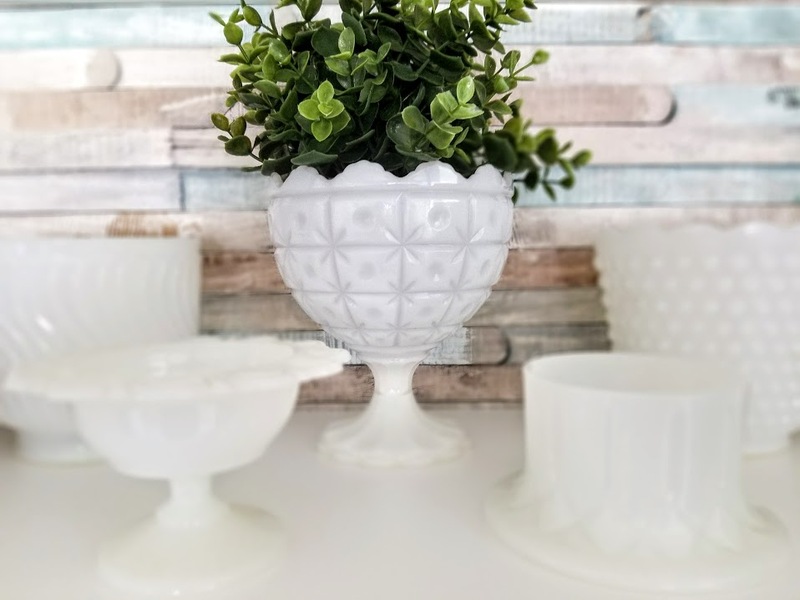 Can’t go wrong with milk glass!!! You’re collection makes me want to head to the thrift shops NOW. They’re really pretty. Thanks for sharing! Thanks for sharing such an amazing idea. I am going to start collecting milk glasses for my home. Rules are made to be broken. Sometimes you find a piece you just have to have. Bud vases are good as taper candle holders too! That cake plate was a bargain! Good for you! And do use it. That is when Milk Glass is happiest! You have a ways to go to have a collection as big as mine.